Facebook friend of The Burger Busters, former Miss Utah, and Master Popcorn Stringer, Joseph Bacon requested that I check out Planet Dailies at the LA Farmer's Market. I was not about to say no to Mr. Bacon, because A. he can bench a Volkswagen Tuareg and B. his name is Bacon, fer gawd's sake. I dutifully made my was to Planet Dailies on a Sunday afternoon in hopes of avoiding a heavy crowd at the recently-opened establishment. I have to admit, as I walked past the stalls selling fresh produce at the Farmer's Market, my hopes for a solid burger were buoyed. I imagined that it would be hard to mess up a simple burger when surrounded, actually surrounded by fresh, quality produce. I found quick seating in the bar area, and that was the last quick thing that happened at Planet Dailies. After a 10-minute wait, a staffer approached me and took my beverage order. Shortly after that, I was handed a flat soda. We managed to sort that out, and I ordered The Dailies Burger ($13.99). About 20 minutes, my cheeseburger arrived. 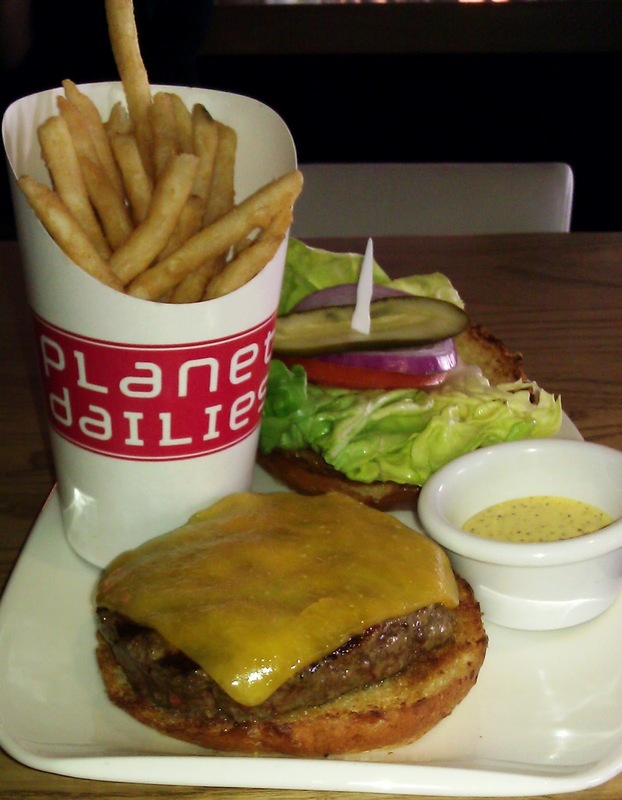 The Beef: The beef in the burger at Planet Dailies was certified Angus Chuck, which was peppered with connective tissue. It arrived pre-ground , and I assumed that it had not been frozen...it was not rubbery. 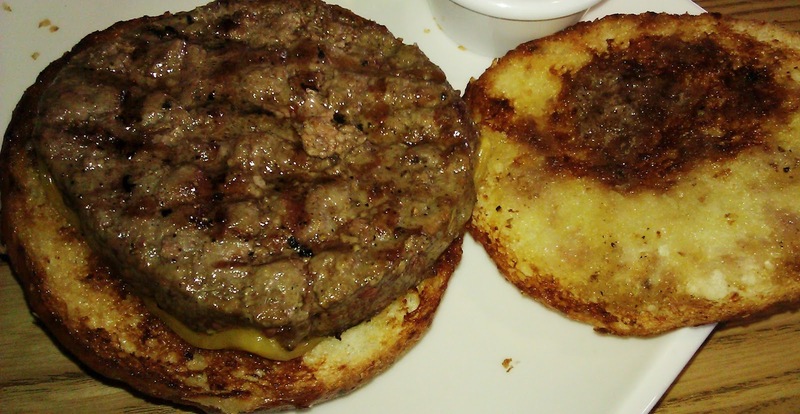 The 7-ounce Chuck patty was moderately beefy, and it had a nice funk from wet-aging. Since it was all Chuck, there were no mineral or steak notes to round out the flavor profile. The bite was loose and very juicy. The staff informed me that the fat content was 20%. I did not inquire as to the source of the beef, because the beef was merely average, and I had no interest in seeking it out again. The Seasoning: I tasted only a faint amount of salt on the exterior of the burger patty. This burger would have benefited greatly from a generous hit of salt and pepper. The Sear: Yawn! The sear on the cheeseburger at Planet Dailies was exceedingly weak. The burger was turned three times, and that was twice too many. 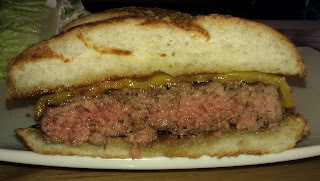 This frequent fiddling with the burger did not allow the surface to reach a temperature where a sear could occur. That was unfortunate, because a decent sear would have done wonders for this burger. The Preparation: The burger patties were formed during the prep cycle. The looseness of the bite indicated that a light hand was employed when forming the Chuck pucks. The Cheese: The Cheddar on my cheeseburger was nominally melted, and it was sweating a fair amount of oil. This suggested and goodly portion of my 20-minute wait was squandered as my burger sat under a heat lamp. The lank Bibb lettuce served to further confirm this guess. The Cheddar was moderately sharp, and it lent some much-needed salt to the dish. The Bun: Planet Dailies served The Daily Burger on a potato bun. The bun was perfectly toasted. The bun was also punishingly bland. It was the starchy equivalent of water. The bun was completely neutral and dry. The Meat To Bun Ratio: WAY too much bun. For fear of desiccation, I ate the second half of the burger with no bun. This also allowed me to avoid having Bedouins set up camp in my mouth. I hate the way camels taste. The Fries: Planet Dailies was located in the LA Farmers Market, but the fries arrived frozen, peeled, and pre-cut. The lightly-battered fries were pretty darned good. The fries were crisp, perfectly salted, and tender. The fries were far better than the burger. The Toppings: Again, Planet Dailies was in the LA Farmers Market, but the vegetation was weak. The tomato slice was flavorless. 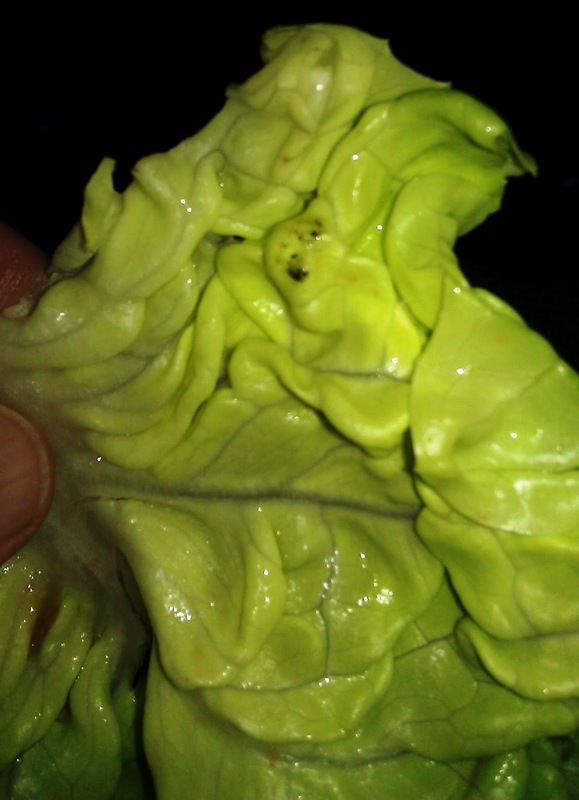 The Bibb lettuce was partially wilted, and it had dirt on it. Clearly, I did not taste the lettuce. The Value: The Daily Burger (with fries), and a soft drink came out to about $19 bucks before the tip. Planet Dailies banged me for a twenty spot for some really average eats. The value was poor. Planet Dailies had a decidedly off day, but even had they been completely on their game, it did not appear that the cheeseburger would have been worth the visit. The Golden State was just down the street, and they have never failed to be excellent. Burger Review : Joseph Bacon, you can safely pass on Planet Dailies.